Michael Smith found himself in his usual spot--in the thick of the action--when he shot this amazing jam session of Roosevelt Sykes, B.B. 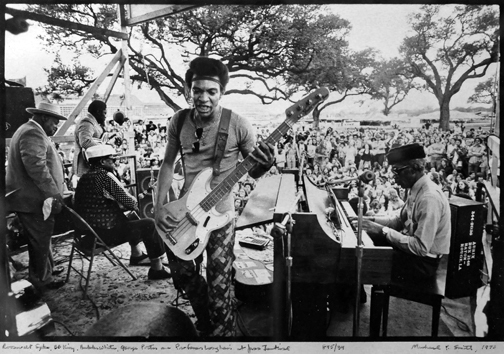 King, Bukka White, George Porter Jr. and Professor Longhair at the 1973 New Orleans Jazz & Heritage Fest. 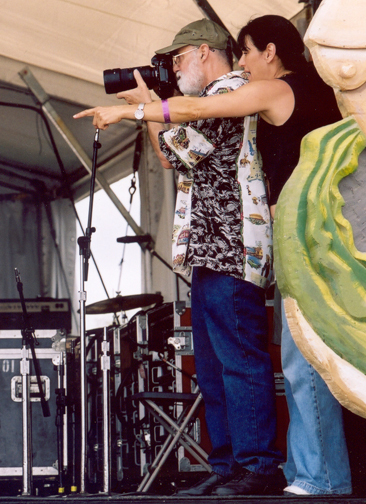 This profile of New Orleans cultural historian and photographer Michael P. Smith was originally published in 2004 in Beat Street, a New Orleans literary magazine now out of print. By that time, Smith had slipped into semi-retirement by then as he began to succumb to the effects of Parkinson’s and possibly Alzheimer’s diseases. Smith passed in 2008 and left behind a legacy that represents one of the Crescent City’s most magnificent treasures. Smith’s prints, negatives and other archival material was acquired by the Historic New Orleans Collection in 2007 where it is being preserved for future generations. His photographs also are in the permanent collections of the Bibliotheque National in Paris, the Metropolitan Museum of Art, the Smithsonian Institution and, the New Orleans Museum of Art, the Ogden Museum of Southern Art, and the Louisiana State Museum. New Orleans photographer David Richmond calls Michael P. Smith “the last true great undiscovered photojournalist of the 20th century,” and places him in the pantheon of such giants as W. Eugene Smith, Dorothea Lange and Henri Cartier-Bresson. But it’s the words of Larry Bannock, Big Chief of the Golden Star Hunters, that would be most likely to bring a smile to Smith’s face. Bannock’s speaking of Smith in the past tense reflects the bittersweet fact that Smith hasn’t been a fixture out on the street for the past couple of years, capturing the pulse and spirit of New Orleans’ mesmerizing subcultures of Mardi Gras Indian practices, social and pleasure clubs, second-line parades and spiritual churches. His battle with Parkinson’s and possibly Alzheimer’s diseases has kept him from pursuing the mission that at once has been Smith’s vocation and avocation in life: to preserve on film the living, breathing, organic, cultural wetlands known as New Orleans. There’s also a lot more information behind those blue eyes that Smith is frantically trying to download into his latest book, In theSpirit: The Photography of Michael P. Smith from the Historic New Orleans Collection, before it slips away. (The book was published in 2009. View an accompanying video here. ) 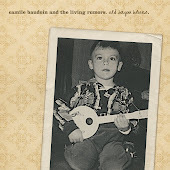 Smith also has coauthored a book with University of Munich professor Berndt Ostendorf on New Orleans jazz funerals that is essentially complete but remains unpublished. While the subject of Michael Smith’s physical and mental health has been of concern to many in recent months, the health and preservation of his legacy—and his monumental archives—has become of paramount importance as well. “The value of this life that Michael has led is enormous, and it would be a shame to let it slip through New Orleans’ hands like so many other things,” declares Rosenheim. Rosenheim was 22 years old when he moved to New Orleans in 1983 and went to work for the Louisiana State Museum. Smith’s first book, Spirit World, a captivating look at spiritual churches, Mardi Gras Indians and other aspects of African-American New Orleans culture, had just been published, and planning for a related exhibition of his work was underway. Besides documenting New Orleans culture with his camera, Rosenheim says Smith also maintains a vast audio archive of events he’s covered. “He used to wire himself with sophisticated stereo equipment and record these parades and funerals.” Listening to those recordings as he worked in the darkroom with Smith’s powerful images “was like a kinetic experience.” The sounds of Smith working his way through the drum section of a jazz funeral, then the horns, shifting this way and that as he finessed his position for the maximum vantage point provide an aural context for these images that should be preserved as well, says Rosenheim. Smith’s body of work reaches deep into New Orleans’ subcultures. 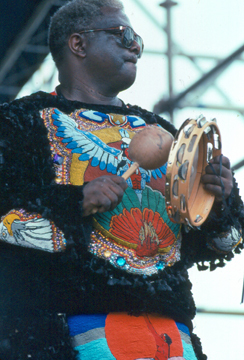 But he is probably best known for his images from the New Orleans Jazz & Heritage Fest. Smith is the only living photographer to have shot every Jazz Fest (until his last in 2004), according to Fest producer Quint Davis. 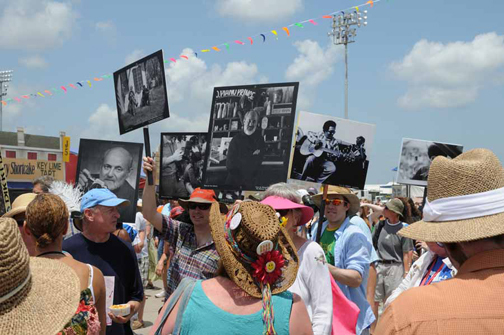 Jazz Fest recognized Smith in 2004 with a showing in the Grandstand of his images printed in large format by David Richmond, and 50-60 of his images reproduced, mounted on boards and placed around the fairgrounds as close as possible to where they were originally shot. 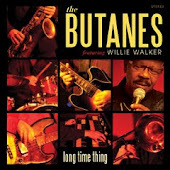 His work also is being exclusively featured in this year’s Jazz Fest program. Smith recognized the value of preserving the Mardi Gras Indian culture and he encouraged Bannock: “Don’t just do the beadwork. Know the culture, know the history, know why the blacks ran away and how the Native Americans helped them.” He also urged Bannock to become registered as a “master craftsman in black Mardi Gras Indian beadwork” with Louisiana Folklife. “One of the people that made me a Big Chief was Mike Smith,” says Bannock. “When I first became a Chief, I was going through a problem, and I was talking to Mike about it. And he said, ‘When you become a Chief, you become the center of attention. People say things about you—negative things. That’s all part of being a Chief.’ And the first thing he said was, ‘Buy your own equipment.’ Everything I needed to make a suit, Mike said that’s what I need. When you got your own, nobody can come at you. David Richmond first knew Michael Smith in 1969, when he took Smith’s place as an assistant to local Black Star syndicate photographer Matt Heron. 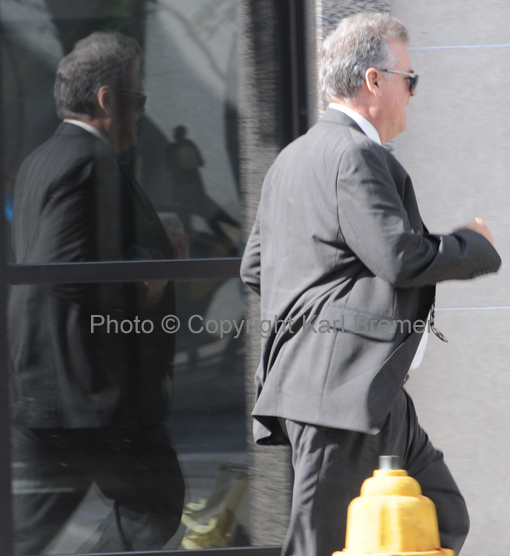 He ran into him periodically in the mid-70s, although they were never close friends. “I had a little gallery in New Orleans in the 70s and that was the first real gallery showing of Mike’s work—the Spirit World stuff. But Mike didn’t hang out with that gallery group. He never spent any time being a dilettante photographer. He was hanging out with people closer to the culture—Jerry Brock, Jason Berry, Jeff Hannusch. The Louisiana State Museum raised the bar for recognition of Smith’s work last year when it purchased 75 archival-quality prints for its collection. “These pictures are going to be the museum’s basis of the representation of African-American culture in New Orleans,” says Richmond. 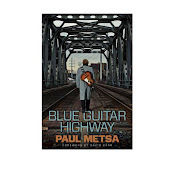 Meanwhile, Smith races against time to finish In the Spirit, which his daughter, Leslie, describes as “an exploration of freedom rituals in New Orleans,” from jazz funerals to the underground gay Mardi Gras. Bannock hopes the recognition that’s due Smith happens soon. A second line parade was held at the Jazz Fest Fairgrounds in 2009 to commemorate Michael Smith and human jukebox guitarist Snooks Eaglin, who passed earlier that year.